Hello and, after about three weeks, here is another edition of the Railwaymedia blog. If you have seen my website in the last few days, or indeed have just clicked the link above, you may have noticed a bit of a change to the layout. Smugmug who have hosted my site since the demise of Fotopic several years ago unveiled a new look this week. Having spent a lot of time customising my own galleries using HTML to create my menus and to display the thumbnail pictures of my own choosing I was highly sceptical about having to redo or change the whole thing. Looking at the various templates they supply themselves I quickly realised there was potential to both hopefully improve the look of Railwaymedia and also to make life easier for myself in the long run. It's taken me the last few days to get to grips with the new organisational tools, including managing to delete my entire collection of Foreign pictures by accident, but I'm now about finished. On to where I've been over the last few weeks. Two of the days of photography were dictated to by where I needed to go with work. The first, with the mainline being dug up between Preston and Warrington for a 9-day engineering blockade, rather than make my way back via Manchester from Crewe I decided to go the even longer way round via Chester and Liverpool. 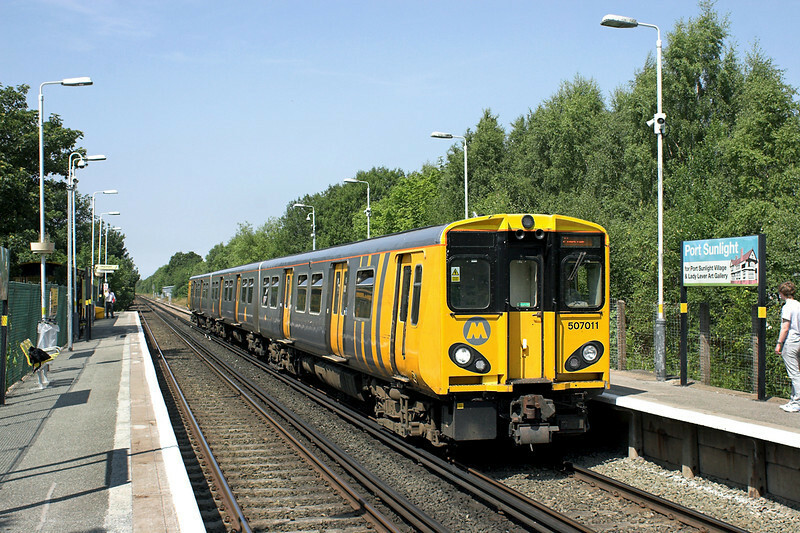 I have travelled on the Class 507 Merseyrail units since they were new, both for pleasure and to get to school. Considering they are, with their Class 508 counterparts, almost 40 years old I think they are still looking in pretty good condition.Whilst I have never been a fan of the livery carried since their refurbishment around 10 years ago, internally they are kept pretty clean and look modern. The following day I ended up in Manchester. 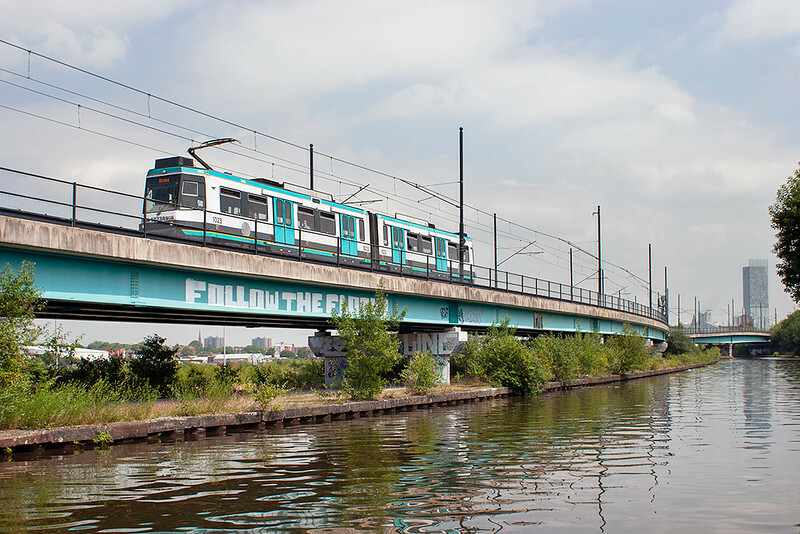 I hadn't yet visited the latest extension to the Metrolink network, the few miles from St Walburgh's Road to East Didsbury. I probably didn't visit at the best time of day for photography as the sun was almost head-on at most stops, though did manage a shot of tram running along the newly laid track at the almost rural station of Withington. 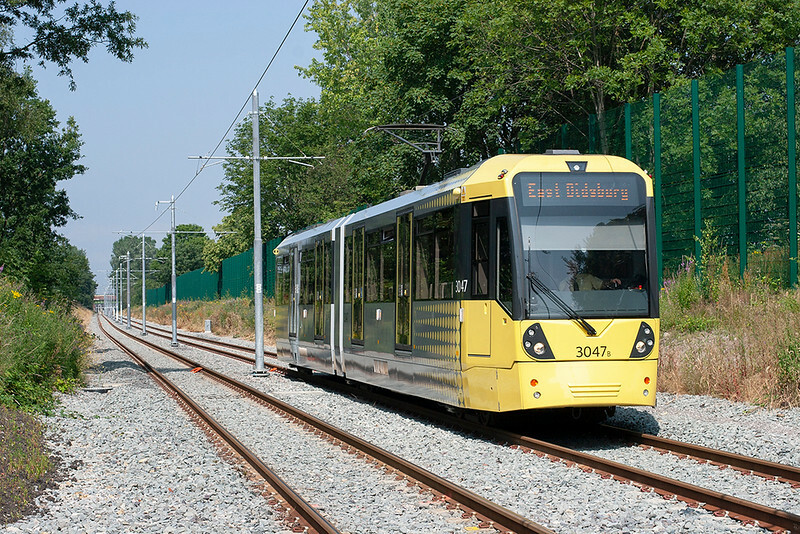 The new Flexity M5000 trams are now passed to run in pairs following the closure of the Mosley Street stop. This stop was unique in being split-height and as such could only be served by double length trams if they were formed from the original T68 vehicles. Now that this has gone and deliveries of the M5000's are reaching the 70th vehicle the end of the older trams is near. There are still a few pairs of T68's running on the direct Bury to Altrincham services, but apart from that the only other stronghold is the Piccadilly to Eccles route. I have taken some pictures previously near the Pomona stop but, with the angle of the sun right, I walked along the Bridgewater canal towpath to get some pictures of these nearer to the Altrincham Line junction at Cornbrook. After yet more tram pictures, pictures of buses next I'm afraid. With an hour or so in London over three days I decided to get some shots of the 'New Buses for London' (also known as Borismasters after London Mayor Boris Johnson). The first handful of vehicles have been running on route 38 for about 6 months to test them out but they were introduced en-mass to route 24 between Hampstead and Pimlico on the 22nd June. Route 11 is the next to be converted on the 21st September. At a reported £350,000 each they are about £30,000 more expensive than a conventional double deck bus, plus there is the ongoing expense of paying for the conductors on each bus to protect the open platform at the rear. I have seen a lot of tourists however waiting specifically to have a ride on one, although of course that might change when there are hundreds of the things about! And so the Borismaster was the last thing for me to photograph in anger with my trusty Canon 20D. After 7 years of faultless performance I finally decided to splash out on a replacement for it, the Canon 5D Mark III. First results from it are excellent, the larger viewfinder and LED screen on the back are certainly a huge improvement, as appears to be the auto-focus. Being summer I've yet to have found a chance to see how the extremley high ISO setting of 25600 performs. Ironically enough the first thing I photographed with the new camera was also a bus, of sorts. I still have the 20D and will keep that in my work bag for now, although I've found that combined with my zoom lens it's a bit heavy to carry around so I might have to find a different lens. The next day I had a proper trip out to test my 5D. The original plan was to meet up with a few friends in the Didcot area. After two weeks of hot sun though this was the day it was forecast for the weather to break and thunderstorms and heavy rain were expected throughout most of the country. The others decided to rearrange the outing but, with a new camera to try and a day with nothing better to do, I chose to go myself anyway. I was beginning to regret it when passing through Wolverhampton and Birmingham with the sky as dark as night and lightning everywhere. Rather than go down as far as Didcot, as I was on my own I decided to stick a bit further north and planned on visiting new locations at Banbury and Hatton. The weather was brightening slightly as we left the Midlands, though a few spots of heavy rain as I walked from the station in Banbury to get some breakfast didn't bode too well. I splashed out on a £4 umbrella as a precaution. It certainly wasn't cold though and I got rather hot walking to my first visit to the bridge at the edge of town at Grimsbury Green. A pleasant few hours were spent here at this quiet road bridge as the weather got better and better, indeed by the time I left there was hardly a cloud in the sky. Hatton, my other target location and another I hadn't been to before, is just west of Warwick on the line from Birmingham Snow Hill to Leamington. 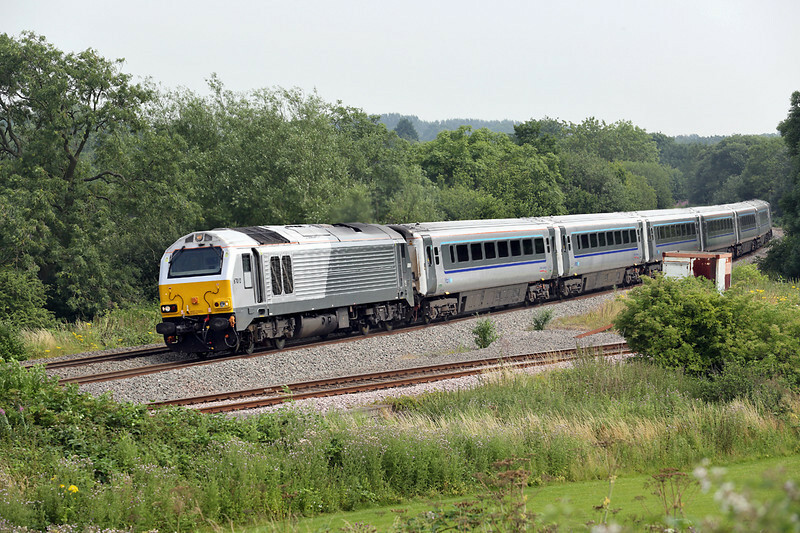 Whilst there are a few freight trains using the route alongside the regular Chiltern class 168s and Cross Country Voyagers, the highlight perhaps is the Chiltern Mainline 'Silver' trains hauled by class 67s. I've mentioned these before in my blog but the current departure times from London to Birmingham (the loco is normally on the north end of the train) are at 0845, 1015, 1315, 1647, 1715 and 1815 along with the 1750 to Banbury. All the days pictures can be seen HERE. In the end I never used the umbrella! 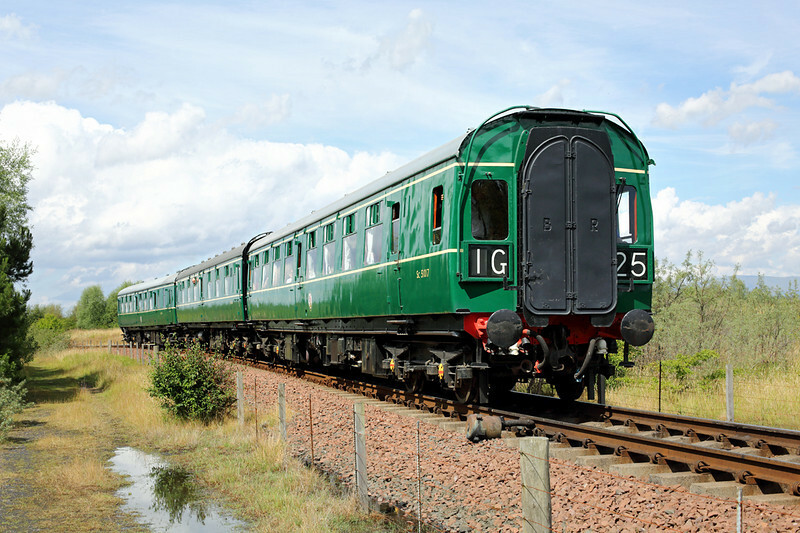 A line I have not been to for a long time, nor photographed before, is the Bo'ness and Kinneil Railway. 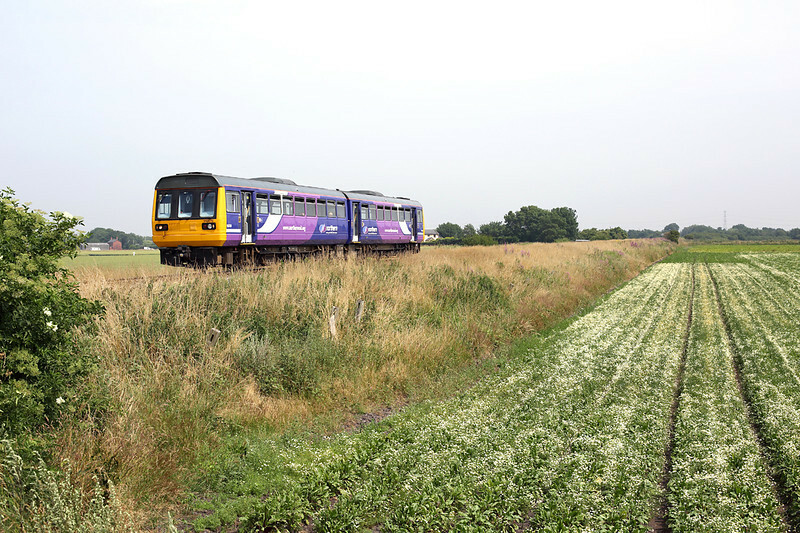 For obvious reasons I can remember the date of my last visit when I was doing my autumn slip/slide training on a class 158 as it was the 11th September 2001. 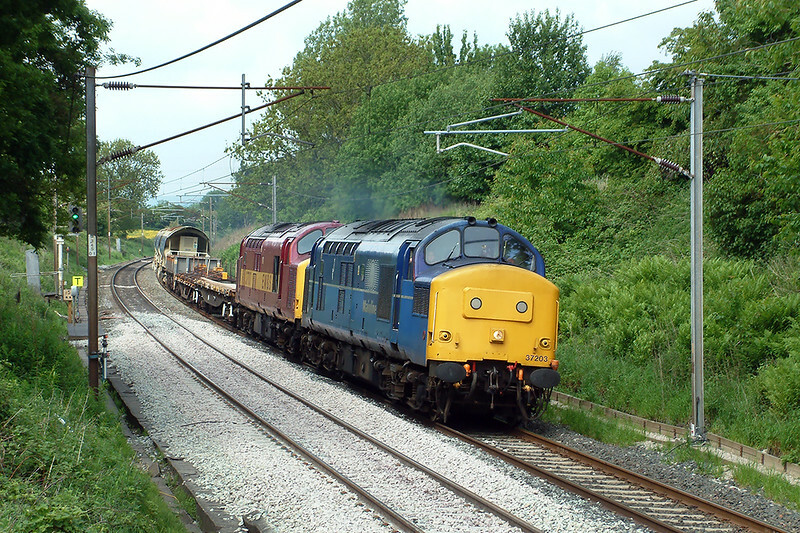 One of the ways most railway companies train their drivers in dealing with the conditions caused by leaf fall in the autumn is by finding a quiet bit of railway not used by other trains, ideally on an incline and surrounded by trees, and then applying copious amounts of washing up liquid to the railhead to simulate the effect compressed leaf mulch on the wheels causes to the braking cpabilities of the train. Anyway, a welcome visit to the line for recreation and many thanks to Peter Kellet for driving me about as I was unaware what locations there were available for photography. It turns out that most of the first mile or so is excellent as the railway goes through parkland between the road and the shore. My favourite picture was probably the one at the top of this blog depicting the railway's class 27 and 26 arriving at Bo'ness station, but the other highlight for me was another class of train that I haven't photographed before, namely the SRPS's immaculately turned out class 126 DMU. 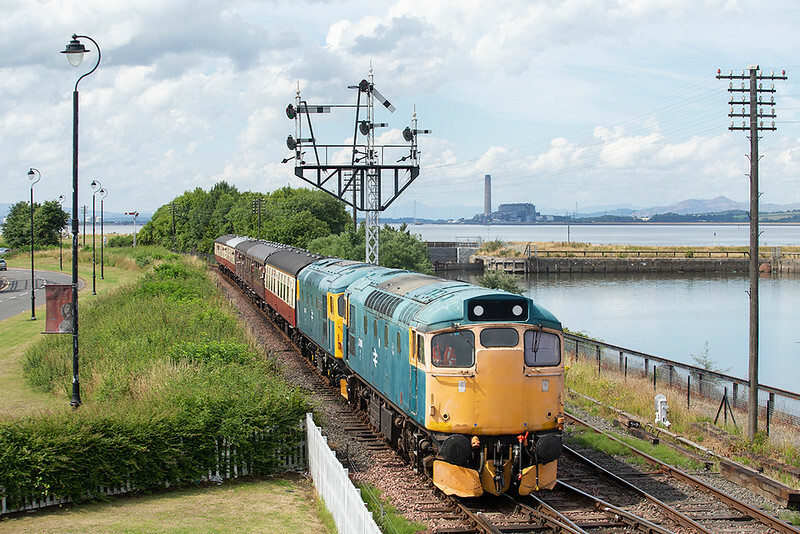 These units were originally introduced in the late 1950s on the main Edinburgh to Glasgow Queen Street route, but were perhaps more synonymous with the Ayrshire Coast route from Glasgow Central until that route was electrified in the early 1980s. 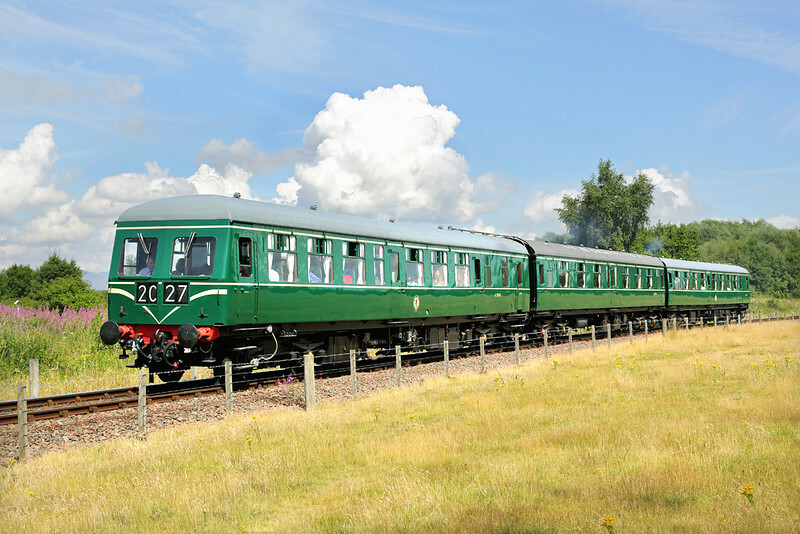 The front design at one end was similar to that used on the Cross Country class 120, which were also built at Swindon, but unlike those units the other driving end of the 126s was fitted with a gangway to enable two units to be coupled back-to-back as one complete 6-car train. A full history of these units can be found HERE. I was lucky with the weather, it only started clouding up mid-afternoon and by the time I was on the train back to Edinburgh it was pouring down. Fortunately for one of my companions who was staying in Edinburgh for the night and as such commented that he needed to find a shop to get an umbrella, I could help and after £4 changed hands he was supplied with a brand new one from my bag. Having the 20D in my work bag has enabled a couple of shots over the past few days. The two orange Harry Needle class 20's were parked at Crewe station on Sunday morning and on Tuesday I arrived back to Preston in time to get to Farington for a shot of the ex-LNER engine 'The Great Marquess' leading the Welsh Mountaineer special to Blaenau Ffestiniog. The weight problem I mentioned earlier caused me to take it out the next day, which was a shame as I missed out on some daylight shots of the sleeper trains Friday morning. 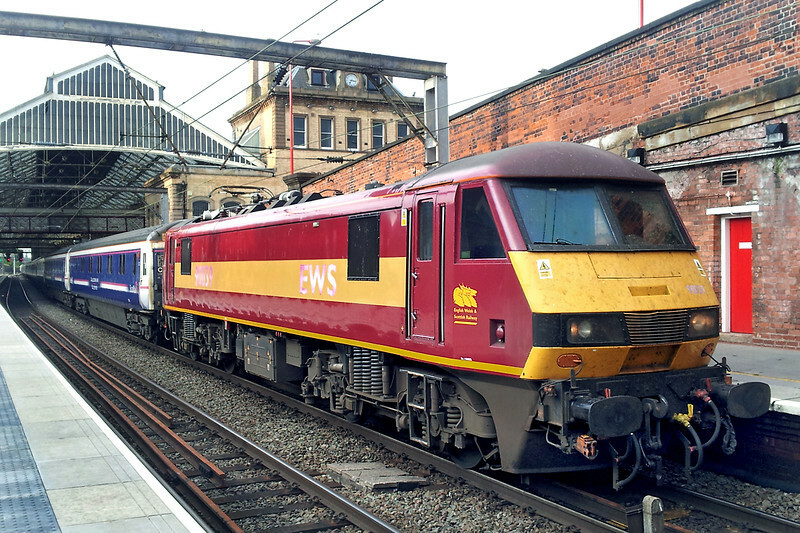 A train fault on one led to three out of four of the trains running between 2 and 3 hours late, indeed the northbound Glasgow and Edinburgh service was still at Preston when I finished work at 0720. Why buy expensive cameras when you can take pictures with your phone? Not fantastic, but the results are OK for a web sized image. Mucking about with my website this week has meant that I haven't got out as I had planned to do to take a picture of 6K05, the regular afternoon Carlisle to Crewe departmental freight, which has after many years changed from being operated by DB Schenker to by DRS. 66428 had the honours on the first day Monday, but given DRS's fleet and the fact it will be a useful train for them to use to transfer engines between their two depots, I would be amazed if it doesn't start to regularly turn up being hauled by heritage traction such as 37s, 47s or 57s. I have been photographing this train since I took the hobby back up in 2002/2003 and in those days it was regualrly hauled by 37s or 56s, I have a seperate Gallery dedicated to this train so hopefully I can add some DRS engines to it soon. Thanks as always for taking the time to read this blog. Due to the reorganisation of my site my New Additions section will no longer show when I've written a new edition, however there are facilities on Blogger to become a 'follower' or send me an email using the contact button on my website and I will add you to the direct emailing list to be notified of all Railwaymedia updates. Over the years I've been suprised by what destinations are contained in the memory of the electronic destination equipment on trains. 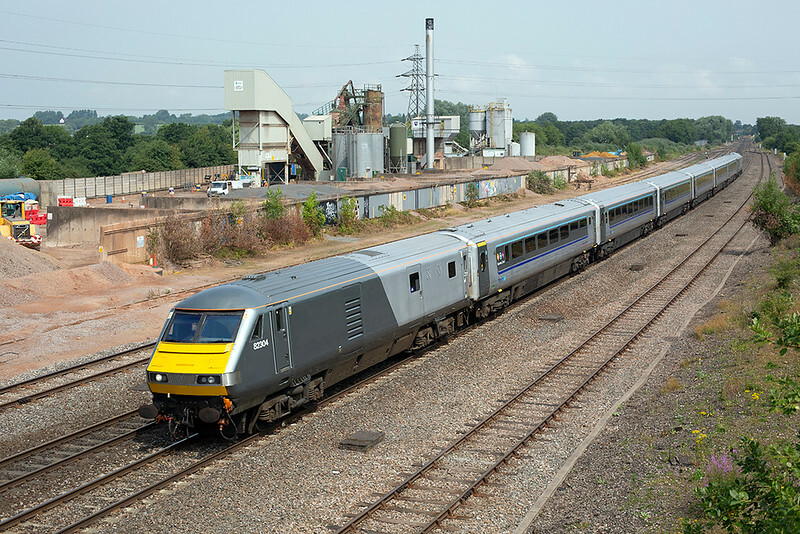 Voyagers can be manually programmed so in effect anything is possible, but with other units such as the Great Western 180s or London Midland 350s you would expect the destinations contained on it to pretty operator specific. A friend found that the 180s contained place names like Alton and Clapham Junction whilst during a trial of modification to software on a 221 it was announcing stations such as Haddenham & Thame Parkway and Glasgow Queen Street. 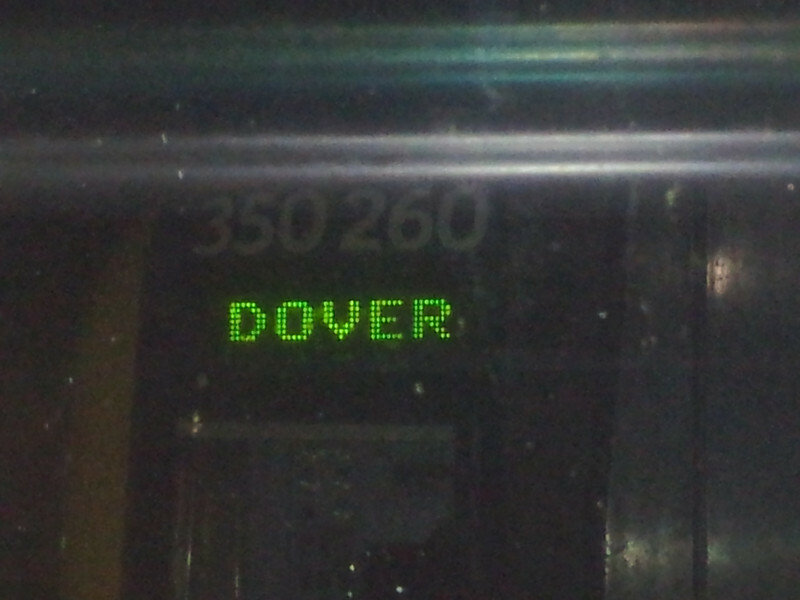 I suppose compared to that, Dover on a LM 350 is tame. Bye for now!